Today I’m pleased to welcome Charlie Laidlaw to my site with some wise words care of Somerset Maugham! That pretty much sums up what it’s like to write a novel. Rather than having rules to follow, it’s an exercise in learning by trial and error. My first book, The Herbal Detective, took years to write because I was writing mostly by error. I didn’t know what style to adopt, I couldn’t get under the skin of the characters and, rather importantly, I had no idea how the book was going to end. I was embarked on a journey without signposts or obvious destination. But, in eventually finding a narrative structure that worked, I also found a way to finish the book. Along the way I may well have discovered the three rules for writing a novel. Alas, like Somerset Maugham, I have no idea what they are either. 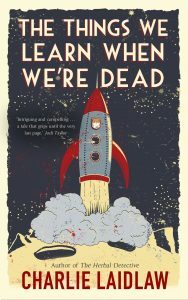 My second novel, The Things We Learn When We’re Dead, has just been published by Accent Press. As a book, it has heart and warmth, and I’m pleased with it. However, even before I put pen to paper (or finger to keyboard) I realised another valuable lesson in novel writing and a blindingly-obvious truism. The simple truism is that every piece of fiction being written now has already been written many times before – mainly by Shakespeare, although he also leaned heavily on much older sources. It doesn’t matter whether you’re writing about love, war, betrayal, death, marriage, alien invasion or the zombie apocalypse, a lot of other novelists have already been there, done that and got the T-shirt. The best we can hope for is to find narrative angles that tread well-worn paths in new ways. For example, try reading Anatomy of A soldier by Harry Parker. It’s about a British soldier being horrifically injured in Afghanistan. But the impact of the book comes from a shifting narrative that is recounted by the inanimate objects that surround him – from a battery to a bullet, from a medical swab to a military drone. The overall effect is both distancing and weirdly intimate. The first semi-grown-up book that made a mark on me was Jenny by Paul Gallico. The central character is a small boy who is transformed into a cat. It echoed an Alice in Wonderland madness, but with adult themes. Or think The Last Family in England by Matt Haig, as narrated by a Labrador called Prince. Or Mark Haddon’s The Curious Incident of the Dog in the Night-time, written by a teenager suffering from Asperger’s, and which was inspired by Jane Austen. As a writer, I suppose you have to be a reader, and those books – and many, many others – have been absorbed and distilled over the years, helping to inform my own writing style and the ways in which books can be made to work. The idea for The Things We Learn came to me on a train from Edinburgh to London and so powerful was the initial idea that I hoped that the train would break down, or for spontaneous industrial action by the train crew. I was therefore disappointed when the train pulled into King’s Cross, regrettably on time, but I did have the outline of a narrative – and, more importantly, a first and last chapter. The first chapter has changed out of all recognition, but the final chapter is still much as I first wrote it. The other lesson I learned on that train journey, as well as the obvious truism, is not to flinch from the fact that what you’re writing has been done to death before. If anything, recognise that fact and celebrate it. The outline of my story is that of a young girl who gets banged on the head, wakes up in an imagined Heaven, and goes about reassessing her life. It’s about second chances and doing things differently. Having dreamed up the book’s outline, I also immediately knew that it was a hook-line-and-sinker reworking of The Wizard of Oz. The Things We Learn is therefore a modern fairy tale for adults; it’s about the subtle ways in which we change, and how the small decisions that we make can have profound and unintended consequences. But, based on the timeless classic, it also had to fulfil familiar expectations, while offering an oblique construct on a familiar theme. What absolutely couldn’t change, of course, is that my character, like Dorothy before her, also chooses to go home. So what I learned, on that train journey and on many others, is that there is no such thing as absolute originality. There is only narrative angle and recognising all those other writers who have gone before. But, sometimes, in rewriting other people’s stories, there can be unexpected echoes. In my book, the central character is mesmerised by Edinburgh castle, which at night seems to float above its rock like a giant spaceship. That image helps to illuminate her imagined Heaven. But only in the past couple of weeks I learned that the MGM set designer, George Gibson, who created the scene where Dorothy and her companions first see the Emerald City was born and bred in Edinburgh in the lee of the castle – and who quite possibly also took that as his inspiration. The fact is that there is nothing new under the sun, although there may well be three lessons on how to write a novel. If anybody knows what they are, do please let me know. Charlie Laidlaw couldn’t help being born in Paisley and is a graduate of the University of Edinburgh. After brief stints as an actor, puppeteer, food service dogsbody and baby photographer he became a national newspaper journalist, first in Glasgow and then London. He subsequently worked as something-or-other in the defence intelligence community, and finally as a PR and marketing consultant. He is married with two grown-up children and lives near Edinburgh. His first novel, The Herbal Detective (Ringwood Publishing) was published in 2015. His second, The Things We Learn When We’re Dead, has just been published by Accent Press. 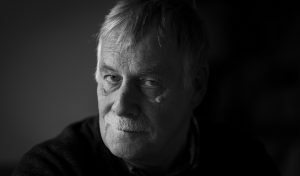 Thanks ever so much for such an interesting blog – if anyone gives you the answer to the rules of writing- do let me know! Great interview Jenny and Charlie. Sage advice for all aspiring writers.